In what developed into a very competitive pre-season friendly against Welsh Premier League visitors Airbus UK, it was the Magpies who were the first to take off in a blistering start. But after spurning the chance to lead from their fourth pre-season penalty award and going into the break only one goal up, Chorley surrendered midfield control in the second half. And they were undone by two strikes from distance by wily experienced campaigner Matty McGinn. Sefton Gonzales was hauled down by keeper Ryan Neild for the penalty which the striker took himself. But he delivered the kick at saveable height and Neild parried it, then kept out Marcus Carver’s attempt from the loose ball and with help from a team-mate also blocked Dale Whitham’s follow-up. But a flowing textbook build-up from back to front created a Chorley goal on 29 minutes. Matt Challinor neatly supplied Gonzales through the middle and he played the ball wide to Will Beesley on the left. The full-back centred square across the penalty-area to the overlapping Challinor, who returned the ball into the six-yard box where Gonzales rose to head past Neild. Then a Beesley free-kick was athletically turned over by the Airbus keeper as Chorley finished the half on top. There was nearly a second for the hosts early in the second half as Carver, from a tight angle, tested the replacement keeper, whose attempt to palm the ball to safety cannoned back into play off the crossbar. But Airbus were showing greater zest for the game now and Sam Ashton pulled off a tremendous save to tip over a thunderous shot destined for the top corner. However, the reprieve was short-lived, McGinn in the 63rd minute hitting a real daisy-cutter from 25 yards which skimmed just inside the post. A five-minutes’ interruption followed while the emergency services treated a spectator and, within five minutes of the resumption, McGinn struck again, this time with a 30-yard free-kick which took a big deflection and completely wrong-footed Ashton. It proved to be the decisive goal as Airbus saw the game out with great resolve, urged on incessantly by manager Andy Preece, to claim a victory they clearly savoured. This was the third home friendly defeat for the Magpies by the same scoreline. 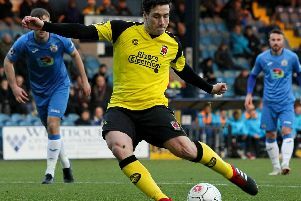 Again, there were many first-half positives but Matt Jansen’s men will need to show more midfield steel than was evident here in the second half if they are to hit the ground running in National League North in three weeks’ time.